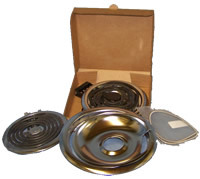 Surface burners, Spring Coil oven elements, Cal-rod oven elements, drip pans, trim rings etc. Need help with parts for your antique or vintage stove? Just contact us!